It's hard managing a meal out out, when you have an allergy/intolerance. One of my sisters got in a right old huff recently, when I questioned her choice of restaurant for a family get-together. It was obviously my fault I could eat hardly anything on the menu!! Before I had gluten to deal with, and we just had the dairy to worry about, there was definitely more choice. Now, not so - especially since we have moved further away from London, where there seems to be a lot more choice. 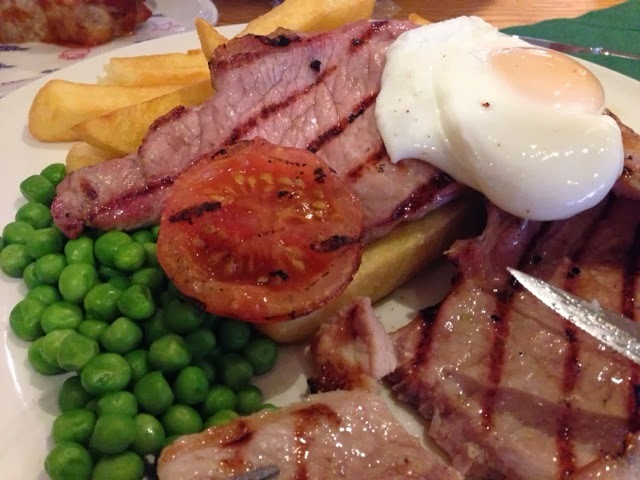 Consequently, for my birthday this year, I ended up at a local pub, where we knew 'Baby' could and what's more would eat their ham and chips. 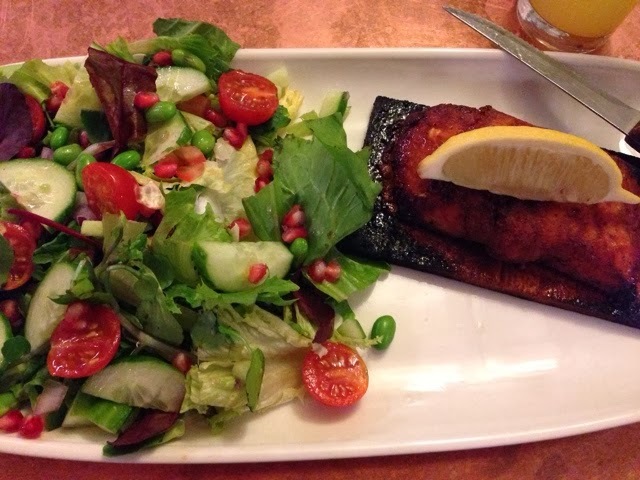 However, the only thing on the menu that I could eat was grilled salmon with salad - not even chips! And I couldn't eat half the salad, 'cos it was made with edamame (soya beans) and cucumber. Was there a hearty dessert to follow and fill me up??? Uh! That'd be a no, then!! Meanwhile, The Hub couldn't decide because he had so much choice!! What I ate - looks lovely, but left me empty and check out how small that fillet is!! Cost more than The Hub's too!! Reading through the results of a recent survey of the Free From community, it seems this kind of experience is all too common. Along with the lack of choice, is the worry of staff really understanding the issue as well as the worry as to whether they're doing their best to prevent cross-contamination of your food. If you're at all interested in reading the results, take a look at Sarah @Sugarpuffish's blog post on eating out. It painted an all too familiar picture regarding eating out with allergies/intolerances. However, I believe that it doesn't have to be this way - a few simple changes could make all the difference, providing more choice on the menu, making things easier for us as well as bringing more custom to them, which hopefully, they'd welcome. Then perhaps we wouldn't see so much of this lip-service, when we enter a restaurant (see below) but would be provided with real choice instead! Hmm! Not much choice on the children's menu!! Good job they allowed me to pick from the adults, for 'Baby'! I've decided to list these suggestions, in the faint hope that someone in the restaurant trade will stumble upon them and come up with something better - after all, I have no chef training and yet... I have a few ideas!! Roast chicken, beef etc. (leave the butter glaze off the veg. and avoid using ready made roast potatoes covered in wheat flour) I can manage without extras like gravy, I'll bring my own, if you like! 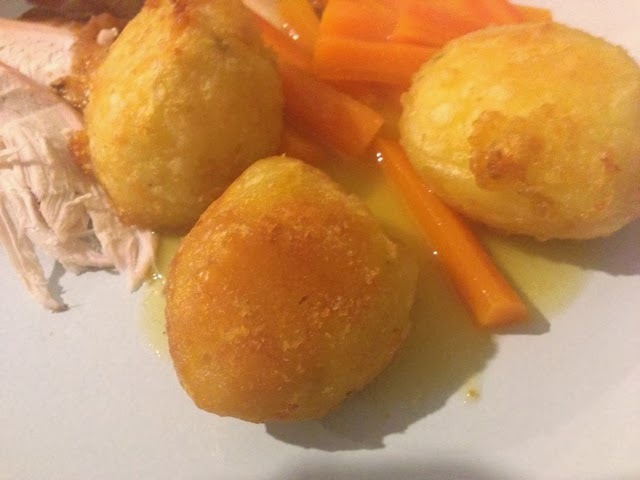 The Hub's roast potatoes - no flour, no butter, just olive oil and Jamie Oliver's recipe! Pizza - gluten and dairy free bases are now available - many pizza restaurants (eg. Pizza Express, Dominoes) now sell them as an alternative. If you could stretch to some Mozzarisella on top, I'd love you forever!! But otherwise I'll settle for cheese free. Tuna & Mayo/Chilli Jacket Potato (use Hellman's Original - not light). Just why are Jacket Spuds (once a pub menu staple) now so out of vogue?? I LOVE them! And they're so much healthier than some options! Sausage and Mash - a lot of high end sausages tend to be gluten and dairy free and you can make my mash with the water it's boiled in (if you don't have dairy free milk) plus a small knob of dairy free margarine. Now, granted, desserts are generally a bit more tricky, for the dairy free, although some restaurants can do gluten free. What doesn't count as a dessert, in my opinion, is sorbet or fruit salad (I can't eat most raw fruit - oral allergy syndrome) it just doesn't measure up to what everyone else is scoffing. ...hopefully these wouldn't take up too much space in the cupboard! Gluten and dairy free loaf/buns (BFree are a great brand for this, they're soya, egg and nut free as well, are longlife, and can also be frozen. If you get their wraps, I can have a Fajita). Gluten Free Pasta (to go with the Spag. Bol. obviously, although coeliacs who aren't dairy free might prefer a Carbonara, or Seafood Linguine). 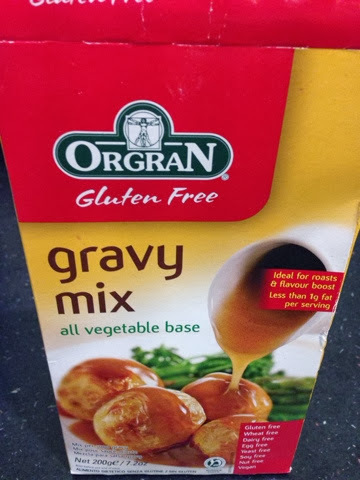 Gravy - I would suggest Anthony Worrall Thompson's instant gluten free chicken gravy which was excellent but that's now out of production, but Orgran's would be suitable for a range of special diets, including nuts! Koko Coconut Milk and/or rice milk - I'll give them a bit of lee-way here, but both are long life, so suitable for keeping. Soya milk is most commonly used but many people allergic to dairy also can't have soya, so best avoid this. Coconut milk can be a bit strong in flavour for some but is good in custard/rice pudding. Rice milk is not suitable for under five year olds in any great quantity, but is okay when used in cooking. Bird's custard powder - easy to whip up with just a bit of dairy free milk! Space in the fridge? A tub of Sunflower Pure margarine would be suitable for many. And, if there's a tiny bit of space in the freezer... some dairy free ice cream which will keep for ages (now widely available). ...to maximise the suitability for all your customers - or as many as possible!! Heinz Tomato Ketchup is gluten/dairy free. It's such a small thing but can make a BIG difference! Witness the concern on Twitter recently about Mac Donald's dropping Heinz tomato ketchup (known to be gluten free). Hellmann's Original Mayonnaise - Here I'm thinking of the many times I've investigated the tuna 'option' only to discover the mayonnaise contains milk (it's usually Hellman's Light - how bizarre that the 'Light' version contains cream powder)! To my uneducated eye, all these suggestions look relatively easy! Not so easy, perhaps, if you enter a restaurant which only serves what basically amounts to reheated ready meals (we all know it happens) but these could always stock some Baked to Taste pies. HOWEVER, Leon restaurants manage to churn out good food fast, that is suitable for the gluten and dairy free (it's improved even further, since I reviewed it). Now as for other eating establishments, surely any chef, worth his/her salt can manage most of this stuff - I mean an omelette and sauteed potatoes?? Simple enough, surely?? SO come on chefs, show up!! Step up to the plate and just as Tom Crusie yelped, 'Show me the money', I'm asking: SHOW ME THE MENU!! Please?? Well said that woman! It does amaze and worry me that restaurants and cafes with so many competent and cooks and chefs can't manage to cater for people on freefrom diets. As you say we have to learn how to adapt to avoid our allergies and intolerances without any professional training. This often leads to people who previously couldn't or wouldn't cook becoming extremely sufficient and creative in the kitchen. I wonder if the fear of cross contamination or causing a reaction has become to risky for cafe and restaurant owners. In the age where a customer will sue a restaurant for gross negligence (e.g. Jamies Italian case) it is not surprising that establishments are worried to serve us. However, there is much they can do to learn and provide for freefrom customers. Let's hope that as the population requiring freefrom food is growing, demand will influence supply. Some great suggestions there... Eateries of all kinds just need to get their heads around the fact that serving 'freefrom' is not that difficult - indeed, soooo many of the dishes that they already serve either already are, or very easily could be, dairy and/or gluten free! Hopefully we will be able to get more of that message across via our new FreeFrom Eating Out Awards! A bit too much seafood and fish for us here, but yes, it's not hard to come up with something that avoids the most likely allergens as most of us do it everyday. We always rely on the ultimate jacket spud - baked beans - but getting harder to find, you're right. Keeping it simple seems to be easier for restaurants who do cook from scratch. Have noticed that more places are doing DF sorbet, which is good to see. We've also been enjoying Pizza Express' new GF and DF bases. Yes, well the post was mainly about dairy and gluten free choices :) However, I was aware that so many are battling various other combinations - dairy and egg is another common combination that needs more recognition among the food industry. You never see 'egg free' written on the packets of the free from supermarket aisles, unless it's Kinnerton chocolate! And then there's the nut problem too! Have to say, I'd be no good with a baked bean filling for my jacket, as baked beans are one of the legumes I can't tolerate, but if Jacket Potatoes were offered with a variety of fillings, the chances are that most people could find something that was suitable for them, I hope/think. I'm glad you like sorbet - it's often too acidic for my stomach (heartburn). Being a carbs woman, I'd so LOVE to see something filling! I just want to say thank you for writing this blog! I stopped eating dairy last year, and your blog has helped me SO much in the search for information about alternatives. I used to love eating out, but now I actually dread it. I hate having to ask what's dairy free on the menu, especially if the waiters etc aren't particularly keen to help. I've also discovered that sorbet is usually the only dessert option, or if you go to weddings - fruit salad! I'm bored of fruit salad now, haha! Thanks for the tip on mayonnaise - I usually buy full fat anyway because the lower fat versions seem to have more salt, but I had no idea they had cream powder! Love your suggestions and maybe one day more eateries will take note of the growing number of customers who would eat out more regularly if there were free from choices but I do have to agree with Emma Louise in that the risk of cross contamination or an allergic reaction is too high for some restaurants/cafes/etc to consider having free from options on their menus. We ate out on Saturday for a family birthday and although all choices for my son were made with the aid of a very detailed allergen folder he still became ill yesterday afternoon with all the usual symptoms of having had some diary. I am presuming that this has happened from what he ate whist we were out as we are ultra strict at home and I am 100% certain that what he has eaten at home is safe. We just have to deal with a dairy intolerance (which is bad enough!) 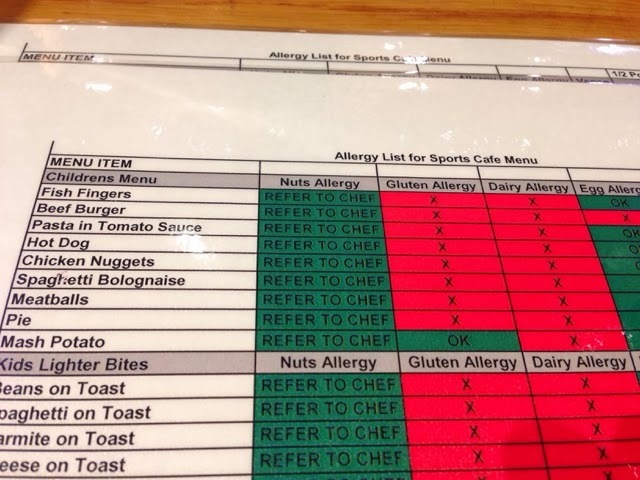 and I guess we took the chance and hoped that the disclaimer of 'all our food is prepared in a kitchen where nuts, gluten and other allergens are present' was a reflection of good working practices in this establishment. At the end of the day I can cook two meals at home at the same time if necessary without any cross contamination - one dairy free and one not - as can lots of other parents in our situation so it shouldn't be that difficult for the professionals should it!! Thank for linking my blog post. Of course I want to see an overall improvement for catering to allergies for everyone. Lets see an improvement in excluding the top 8 at least. Lunch on the Go provides me with the biggest challenge, in fact I find it impossible in terms of the stores within my reach of the office or when out shopping. I want to see more Vegan food on menus not Vegetarian because Vegan food meets my requirements of lifestyle choice & allergies. What is this obsession with CHEESE, at least make the cheese a removable option and not shove it into the middle of a veggie burger. Always worry about sloppy practise and cross contamination. 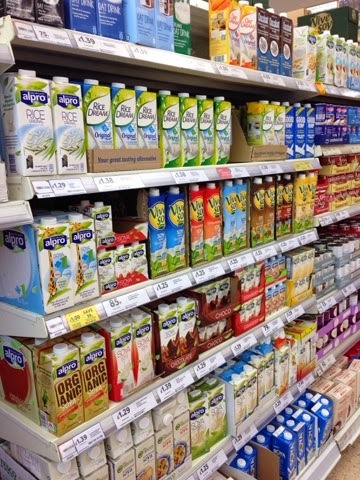 When we go out we have to find dairy/wheat/gluten/nut/egg/soya/banana/kiwi free, nigh on impossible. Some places could help by peeling potatoes for chips instead of frozen processed potato with gluten in to hold it together. We have even found places if we supply them with grandsons food they will cook/reheat it for us and serve it with everybody elses so he does not feel left out.